President Donald Trump on Tuesday can land his most devastating blow yet on the legacy of Barack Obama, but a move to pull out of the Iran nuclear deal could also spark a dangerous global crisis. The decision could mark a signature moment for Trump's presidency. It gives him the chance to cement his "America First" philosophy but risks triggering unknowable consequences that in a worst case scenario could lead to war with Iran. The decision gives the President a choice. Does he follow his instincts and honor a campaign promise to his loyal political base? Or does he risk dealing a severe rebuke to US allies who back the deal by re-imposing US sanctions on Iran? Alternatively, he could claim the headline of refusing to continue waiving sanctions against Iran, but stop short of imposing new punishments immediately. That could keep open a narrow window for America's European allies to continue trying to broker a broader deal that could keep Trump on board. Given that Trump's gut usually wins out over his concern for America's friends or complicated calculations of geopolitical ramifications down the road, it's no surprise most people think he will pull out of the deal. "It's pretty obvious to me that unless something changes in the next few days, I believe the President will not waive the sanctions," CNN's Jim Sciutto quoted a European diplomat as saying. "And that will have various consequences that I think we have yet to fully to understand and spell out." Leaving the deal would represent another sharp turn away from the multilateral diplomacy that underpinned Obama's foreign policy and America's approach to the world for much of the 20th Century. It would also introduce an illogical note into Trump's own diplomatic strategy, since he would be withdrawing from one nuclear deal with a US enemy, while trying to negotiate another, with North Korea. Yet Trump, who last month called the deal "insane" and "ridiculous" is notoriously unpredictable. He could still spring a surprise. So all eyes in Washington, Tehran, Beijing, Moscow and EU capitals will be focused on the White House at 2 p.m. ET when he will stand in the global spotlight -- where he loves to be -- to make his announcement. Trump has been teasing his decision for days and may have given a hint of his intentions on Monday when he slammed former secretary of state John Kerry and his reported initiative to save the deal. "The United States does not need John Kerry's possibly illegal Shadow Diplomacy on the very badly negotiated Iran Deal. He was the one that created this MESS in the first place!" Trump tweeted. If Trump does decide to pull out of the Iran agreement, known as the Joint Comprehensive Plan of Action, it will be because he thinks it's the "worst deal in history." The President has frequently misrepresented the terms of the deal that froze Iran's nuclear program and complained that it does not halt Tehran's missile tests or power moves in the Middle East. He repeatedly brings up the billions of dollars in unfrozen Iranian assets and funds held in escrow that were returned to the Islamic Republic after the deal was agreed in 2015. Obama's reasoning was that the prospect of an Iranian nuclear weapon was so dangerous that a deal to stop Tehran short of a weapons threshold was the most urgent priority. Deal supporters say that the pact has stretched the "break out" time Iran would need to race to a bomb to at least a year, has mothballed most of its centrifuges and all but eradicated its uranium stockpile. "Now that these handcuffs are in place, I see no possible advantage in casting them aside. Only Iran would gain from abandoning the restrictions on its nuclear program," British Foreign Secretary Boris Johnson wrote in the New York Times on Sunday. 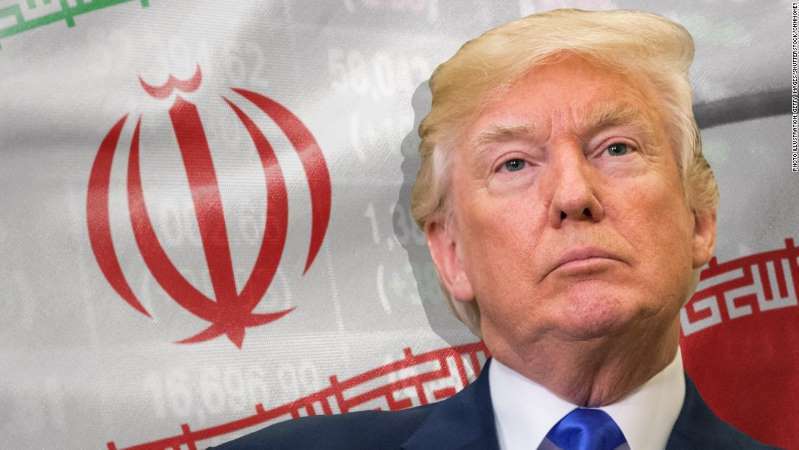 But critics say the deal includes sunset clauses that will eventually allow Iran to resume the production of highly enriched uranium that could be used for weapons. The President promised to kill the deal on the campaign trail but allowed himself to be persuaded by cabinet members and allies several times to recertify Iran's compliance, to his evident fury. But now, with a new foreign policy team including national security adviser John Bolton and Secretary of State Mike Pompeo, who also oppose the deal, the President may have a freer hand. Still, some Republicans in the national security establishment argue that the consequences of leaving could be worse than staying in. Defense Secretary James Mattis last month told the Senate Armed Services committee that the verification provisions in the pact were "pretty robust" though he did not publicly back the deal. Despite his criticism of the deal, neither Trump nor his aides have been able to say that Iran is infringing the agreement. And there has been no detailed explanation from the administration about what happens next if the US tears it up. Pulling out of the JCPOA would risk a serious split with leaders of America's traditional European allies, who have trekked to Washington in recent weeks to flatter, cajole and warn Trump. Western diplomats have been trying for months to get Trump to stay in the deal or to negotiate measures on missiles and constraining Iran's geopolitical push that could stand alongside the Iran deal. French President Emmanuel Macron raised the carrot of a "new" deal during a state visit to the White House last month, hoping to get around the President's antipathy to a pact that rates as his predecessor's biggest foreign policy achievement. But privately, foreign diplomats have confided that the biggest problem with the agreement is the visceral distaste the President harbors towards anything that his predecessor achieved. That's one reason why some observers believe that the decision on the Iran agreement is more dictated by politics than statesmanship. "This agreement is highly flawed but it is functional," said Aaron David Miller, a former Middle East peace negotiator for Democratic and Republican presidents, this month on CNN. "Walking away from it without a Plan B I think is a political interest of the President but it is not in the national interest." Iran has said there can be no renegotiation of the nuclear deal, a position shared by Russia and China, two other signatories. If Trump does decide to pull out of the deal, his speech will be closely watched for details that could dictate what happens next. He could simply say that the US does not intend to comply any longer and reimpose sanctions on Iran that were lifted in 2015. If he does not impose sanctions immediately, that could leave a small window for European allies to continue seeking a compromise. If Trump does slap sanctions back on Iran right away, it could give European states an unpalatable dilemma -- do they follow suit or refuse in a move that could split the transatlantic alliance wide open? Trump's move will also pose choices for Iran. With its hobbled economy, Tehran could announce it is sticking with the deal in the hope of accruing the benefits of expanded trade with European firms -- and hope to split the US and Europe. Or it could make a more aggressive move and start to enrich nuclear fuel again, a step that could force European states to reimpose their own sanctions and could precipitate a major international crisis.